Hung in every gallery, museum and exhibition across the world are signs that read, "Please Do Not Touch the Artwork." A simple request that exists for transparent reasons, but why haven't we questioned this rule? Why is touching artwork such a taboo? Cantor Fine Art, a new contemporary art gallery in LA's Pacific Design Center, is challenging that maxim with their new documentary, Please Touch the Art. By chronicling an experience that defies our societal limitation on touching art, they've allowed a blind man to "see" his own portrait for the first time. 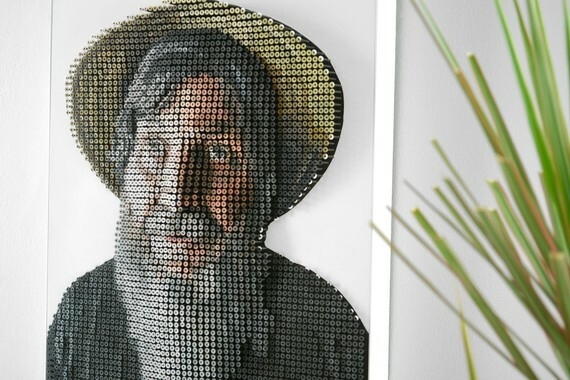 Andrew Myers, who has been represented by Cantor Fine Art since their launch, creates portraits with his signature technique- drilling thousands upon thousands of screws into plywood, crafting authentic sculptures, which he then hand paints in exquisite detail, one screw at a time. His works are tactile, corporeal and awesome. While participating in a public exhibition, a blind man came up to Myers and asked if he could touch his art. Of course, Myers acknowledged this request, ultimately handing him an experience that would inspire him and Cantor Fine Art for months to come. "This moment really struck a chord with Andrew and with us. It lead to a lot of questioning of why touching art was so taboo. 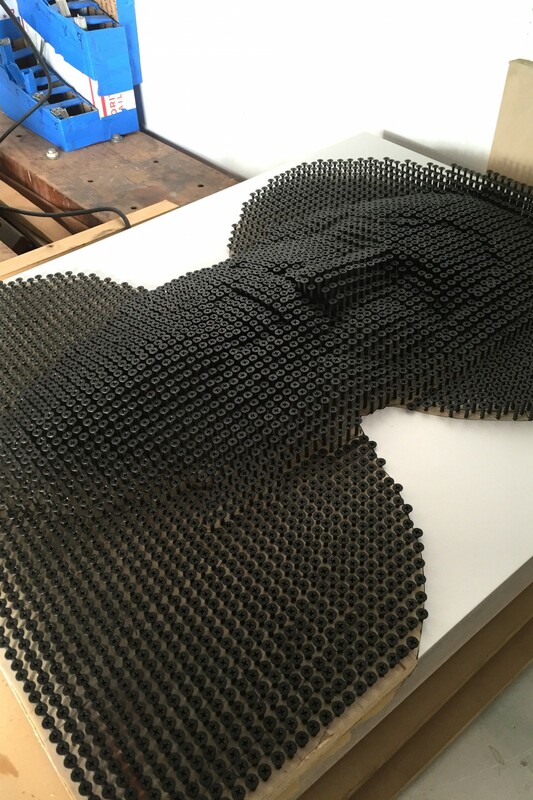 We wanted to know who else was making tactile art, and if they had a similar experience," Sam Cantor explains. "Afterwards, we knew we had to do something about this story and hopefully elevate the work of tactile artists. This lead us on a wild goose chase to try to find the original man that inspired Andrew. We spent the better half of a month cold calling any person or place we thought might know who he was." 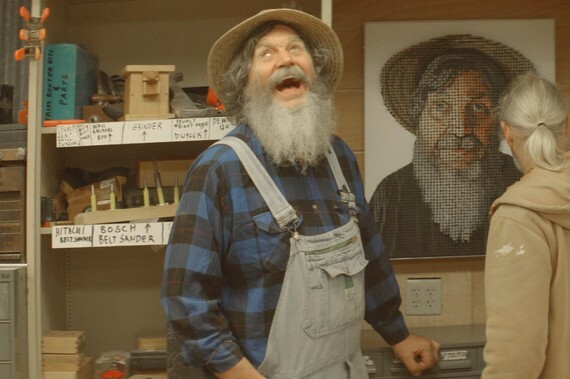 After many failed attempts at outreach, which included Sam getting kicked out of the Braille Institute, Jennifer Sachs, the director of development at The Enchanted Hills Camp for the Blind, contacted the Cantors and introduced them to George Wurtzel, a blind craftsman and artist. They scheduled a meeting right away. "We hit it off immediately. I toured his studio and the camp, it was so inspirational. While we were there, I took a picture of George. We headed back to Los Angeles [from Napa], showed Andrew the photo and he began creating George's tactile portrait. Andrew worked for months on this piece, making sure George's features were as precise as he could possibly make. The portrait contains about 4,000 screws. Needless to say, when it was complete we gently packed up the piece, drove to the camp with Andrew and surprised George with his portrait, encouraging him to feel the work, and the topography of his very own features." Art is often created to break boundaries and push the envelope. Cantor Fine Art, Andrew Myers and George Wurtzel are breaking the confines of what is usually thought of as a disadvantage, and creating a bold, personal experience within the art world. With extraordinary results from an even more extraordinary mission, this project changed the way Larry and Sam Cantor viewed their own collection of work. "This project completely flipped my perspective on what beauty is, and how absolutely amazing the visually impaired community is. I know that sounds sappy, but I really mean it. Not every piece of fine art needs to, or should be, physically touched. But perhaps it's time we all took a look at how pervasive and mandatory the "no touching" rules really are. It may help everyone see artwork a little differently." In order to fully fathom the emotional weight that comes with experiencing a personalized portrait for the first time, and the impact it had on this particular individual, you must check out this documentary. On June 24th, Cantor Fine Art is putting on a tactile art show, also titled Please Touch the Art. There will be a performance by The Academy of Music for the Blind and 10% of the proceeds will be donated to them. Details of the show can be found here and you can also watch the documentary for yourself here.